This double blind, randomised, placebo-controlled study aimed to evaluate the efficacy of Lactobacillus reuteri DSM 17938 supplementation in infants with chronic constipation. 44 infants were enrolled, 6-12 months old and all weaned from breast-feeding. Lactobacillus reuteri was administered for 8 weeks at a dose of 10^8 CFU, once daily and 30 minutes after feeding. In the active group the frequency of bowel movements (BM) was 2.82 per week at week 0, compared with 4.77 at week 8 (P = 0.0001). Compared to those given placebo, the BM frequency in the Lactobacillus reuteri group was significantly increased at 2, 4 and 8 weeks of treatment. In the Lactobacillus reuteri group, the stool consistency was reported as hard in 19/22 (86%) infants at baseline, in 11 (50%) at week 2 and in 4 (18%) at both weeks 4 and 8, with significant difference at weeks 4 and 8 (P = 0.01). However, there was no significant difference in stool consistency between the two groups at any of the time points. Constipated infants supplemented with Lactobacillus reuteri had a significantly higher frequency of bowel movements by time compared to the placebo group. Stool consistency also improved significantly in the Lactobacillus reuteri group, although no significant difference was seen compared to placebo. Fig. 1 Frequency of BMs in the Lactobacillus reuteri and placebo groups. 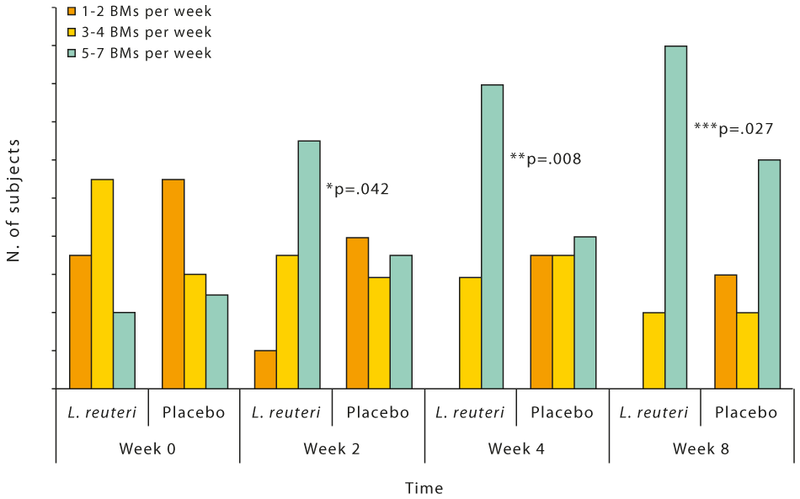 Infants treated with Lactobacillus reuteri had a significantly higher defecation frequency than infants in the placebo group at week 2 of treatment (P = .042), at week 4 (P = .008), and at week 8 (P = .027). Conclusion: Constipated infants supplemented with Lactobacillus reuteri had a significantly higher frequency of bowel movements by time compared to the placebo group. Stool consistency also improved significantly in the Lactobacillus reuteri group, although no significant difference was seen compared to placebo. Coccorullo P, Strisciuglio C, Martinelli M, Miele E, Greco L, Staiano A. Lactobacillus reuteri (DSM 17938) in infants with functional chronic constipation: a double- blind, randomized, placebo-controlled study. J Pediatrics 2010;157:598-602.